‘30 Things That Make Me Happy‘. Being with my husband and children. It might sound cliched but yeah it does! Eating a crunchy toast with loads of butter. Wearing my kajal and red lipstick. Cuddling with my teenage son. It seems as if simply the body has become more lanky and strong, else gives me the same feeling that it used to when he was a little chubby baby. Watching movies or series with my husband. Great to keep our relationship alive! Aroma of freshly baked cookies and cake. The toothy and innocent laughter of a baby. Writing blogs and sharing anecdotes of my life is therapeutic. Giggling with my preteen daughter on all sorts of nonsensical funny jokes. Traveling in a cab across the length and width of Mumbai city (yes amidst all the chaos and traffic). I love Mumbai. Trying out new shades of hair color. Painting my nails in new shades. Cooking chicken curry and rice. Helping a new mother with my own experiences. Giving a depressed woman pep talk and motivating her. Irritating my husband when he is on mobile! Watching my children becoming independent and responsible. My heart swells with pride when I see my teen son being respectful to women. Happiness is when my husband and son cook a sumptuous breakfast and dinner for me. Listening to old songs and reminiscing our childhood with my husband. Watching the rains from my 14th floor apartment. Going in events and meeting new people, especially inspiring women. Catching up with friends over coffee/lunch. Going on a long drive with my family and watching the night sea in Bandra Bandstand or Worli Seaface. Wearing a new outfit and feeling glamorous! Group hug with my husband and children. Closing my eyes and falling asleep immediately. 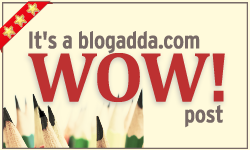 Thanks a lot for reading and appreciating the blog.